OK, hear me out. I realize summer is over. The temperatures are dropping, and even though I'm clinging desperately to the last of my vegetables, the frost will soon win. But there's still time to barbeque before the snow falls! And what's better in October than freshly picked apples? Core the top of the apples (you can leave the bottom intact so the sweet, gooey stuff doesn't drip out onto your barbecue). In a small bowl, mix the butter, brown sugar and cinnamon. Place a dab inside each apple. Put the apples on the bbq and cook until the skin is wrinkly - be careful they don't burn! Sprinkle with icing sugar and serve with vanilla ice cream. They're falling off the plants, and making their way onto our plates. I LOVE strawberry season. We try our very best not to purchase strawberries from the US, because it's just so lovely waiting for the delicious local strawberries to arrive in season. The flavour is so much better! Last night I scoured my recipe books for a quick strawberry cake I could make for dessert, and came across this one from Vegetarian Planet by Didi Emmons. If you're going for healthy, this is definitely not a good choice :) But, I did cut the sugar back to 3/4 cup, and it was definitely sweet enough! Preheat oven to 350, and grease a 9 in cake pan. 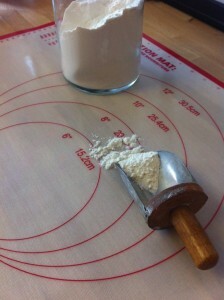 In a large bowl mix together cornmeal, flour, salt and baking powder. In another bowl, mix butter and sugar (don't cream them). Stir in half the beaten eggs and mix. Stir in the rest of the eggs and mix well. Add the vanilla to the buttermilk. Add half the flour mixture to the egg mixture, and stir well (do not beat). Add the buttermilk and stir again. Then add the remaining flour mixture. Fold in the strawberries and pour the batter into the pan. Bake for 45 to 50 minutes, until a knife inserted comes out clean. Serve with ice cream, whipped cream or greek yogurt! Following my cashew yogurt post, we've still been experimenting at home with this yummy nut (but hey, did you know cashews aren't actually nuts? This article was so interesting to read!). My latest attempt has been to find a yummy vegan sour cream. After a few different attempts (there are SO many recipes out there! ), I've found one that is incredibly tasty and kid-approved. Even my husband has given it "the nod" (you know, where they say "hey, not bad," but actually don't want to admit that you're right). So give it a try, and let me know what you think! If you get raw cashew pieces, they soak really quickly. I put them in a bowl of water and use them several hours later. Rinse the cashews and throw them into your blender or food processor. Add all the other ingredients, and blend until very smooth and creamy. You might find there isn't enough liquid, so add 1 tbsp of water to see if that helps. This will store in the fridge for several days, and often gets thicker as it cools. 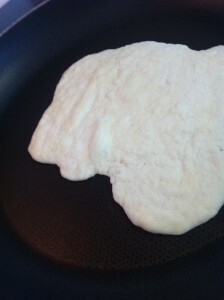 Kids seem to love flour tortillas - my daughter definitely prefers the thin, flexible flatbread to a traditional sandwich. They're also so versatile - you can stuff them with any kind of protein, tons of veggies, or use them for taco night. But I have issues with store-bought tortillas. They're super soft, flexible and yummy, but only because they've been made with a number of additives and preservatives. Take, for example, this package of Old El Paso soft tortilla shells. If you click on the image, you'll be able to read the list of ingredients - the ones that concern me are basically everything but the flour, water and baking powder! 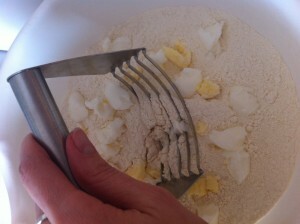 Step 2: Use a pastry cutter (or your hands, or 2 knives) to cut the fat into the flour. You want to do this enough that you end up with little pea-sized pieces of fat mixed in with the flour. Doesn't take much! Step 3: Slowly pour in 1.5 cups of warm water, mixing as you go. I start with a wooden spoon, and then use my hands as the dough starts to form. 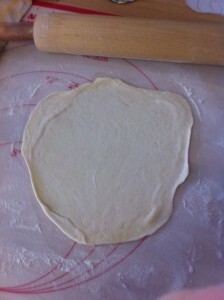 Note: the dough will stick together, but it's ok if it's a bit flaky. If it's too sticky and wet, add 1 tbsp more flour. If it's too dry and won't form a ball, add 1-2 tbsps more water. 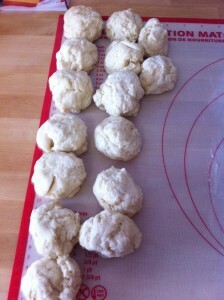 Step 5: Separate the dough into 16 balls. Cover again with the towel while you heat up a non-stick frying pan on HIGH heat. Step 6: sprinkle your surface with flour. I like to use a pastry mat! Step 8: Throw it into your hot pan, and watch it rise and bubble. Depending on how hot your pan is, this could take a mere 15 seconds or 45 seconds. Watch very closely, as they burn within seconds! Flip it once it bubbles, and toast on the other side for 10-15 seconds.